During the January 2013 Artwalk Gainesville, I began my newest painting (series? ), "In the Defense of Eve." 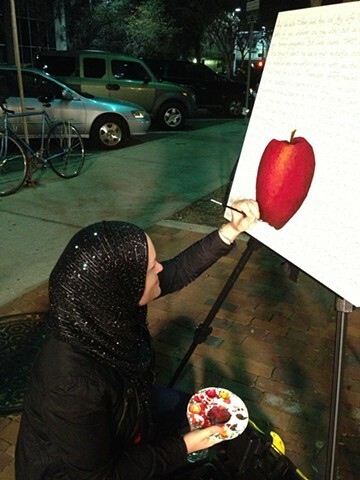 The background of the piece contains verses from the Qur'an that reference the story of Adam and Eve, while the foreground is an image of a female hand dropping a very large apple. The imagery is to symbolize the rejection or release of the burden of Original Sin and the blame that some place on womankind for the fall of man from heaven. Click over to the Reflections gallery to see a photo of the finished piece and read more about the painting.